in Peine - freshly renovated! 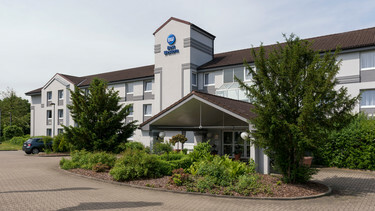 The Best Western Hotel Peine-Salzgitter is situated in the peaceful neighbourhood of Stederdorf in Peine, which is located between the cities of Hannover and Braunschweig. Due to excellent transport connections to the A2 motorway, the hotel is perfect for business travelers and visitors to Hannover Trade Fair (40 km) and Braunschweig Trade Fair (30 km). There are a great number of parking spaces for cars and buses directly in front of the hotel which may be used by guests to the hotel for free. The Best Western Hotel Peine-Salzgitter has two modern conference rooms which can be divided or combined. Our event team will gladly organize weddings, birthdays or other private parties for you. We offer the perfect set-up for a successful meeting or conference at our hotel with professional conference technology, a rapid Wi-Fi connection and air-conditioning. All conference rooms are flooded with natural light and there is direct access to the summer terrace for creative breaks. Perfect for our sporty guests: The Best Western Hotel Peine-Salzgitter has an arrangement with the nearby “AE-Fitness” gym, whereby guests to the hotel can train here using the modern cardio and muscle-building equipment and participate in fitness classes. The sauna and solarium at the gym may also be availed of. You can also find beautiful jogging routes in the immediate vicinity of the hotel if you would prefer to exercise outdoors. Please ask our team for more information on the best routes! Both traditional and international cuisine is served at our hotel restaurant during the week. Classics such as succulent Schnitzel and delicious burgers are featured on our hotel restaurant menu. As well as this, seasonal dishes are often available. During the summer, the sunny terrace of the hotel is a lovely place to relax. Gastronomical highlights include our Sunday brunch and brunch buffets on public holidays. At the Skybar of the Best Western Hotel Peine-Salzgitter guests can follow important sporting events. We will deliver you with regularly changing drinks and snacks. Our hotel in Peine offers 98 spacious hotel rooms which were all renovated in 2016. The rooms convince with modern design and comfortable equipment. Our cozy beds guarantee that you will get plenty of rest over the course of your stay. There are soundproof windows in all of the rooms so that nothing should come between you and a good night’s sleep. There is air-conditioning and a flat-screen TV in all of the rooms at our hotel. Guests can use the Wi-Fi for free in their rooms during their stay, as well as in the public areas at the hotel. The late riser breakfast is particularly popular among guests to our hotel. On the second and fourth Sunday of every month you have the option of enjoying a first-class buffet with sparkling “Sekt” until 1pm. We ask you to please make a reservation beforehand.